On the evening of 02/04/2015 in Lausanne, Switzerland the framework agreement between the P5+1 countries and Iran was signed over its nuclear program. The final agreement will be signed on 30/6/2015. What was striking is that once the reading of the joint statement between these parties finished, President Obama came out to deliver a speech in front of reporters in the White House announcing that the agreement was historic. What is behind this agreement? May Allah send his blessings upon you. Following the agreement the US president immediately delivered a speech in front of the White House allotted to this agreement, he said, “We have reached a historic understanding with Iran over its nuclear program, it would, if carried out prevent Tehran from acquiring nuclear weapons.” He said, “We have reached a deal to stop the progress of Iran’s nuclear program” and added that “Tehran has fulfilled their duties and opened the way for inspection.” He described the deal “as good and that it meets our core objectives” and said, “Iran accepted an unprecedented type of inspection system and the door to Iran’s enrichment of uranium will be closed, and there will be reduction of the stock of enriched uranium and centrifuge by two thirds.” He also said, “We will not allow Iran to develop a nuclear weapon ever, and in return we will gradually reduce the sanctions that we had imposed and that imposed by the Security Council,” and noted that “the negotiations will continue until June to agree on the exact details.” Also stressed that “the nuclear inspectors will have unprecedented influence on Iran’s nuclear facilities.” He said, “For the Iranian people, we are ready to work for the common interests” (American Radio Sawa 02/04/2015)… These statements of the US president shows how keen is the US administration to reach this agreement, and this agreement was in the interest of America, it achieved its objective, and there is no reason for the others to object. He mentioned the position of those who opposed the agreement of the Republicans in Congress and the prime minister of the Jewish entity, Netanyahu. 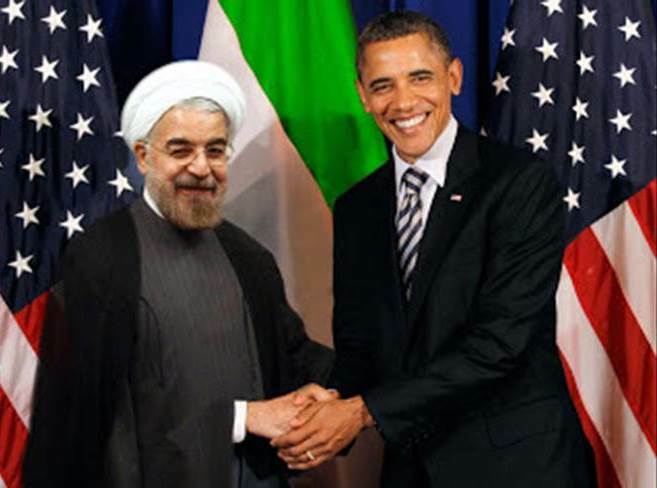 Obama said that he wants to work with Iran under the common interest, i.e. to use Iran to achieve the American projects in the region, he does not want Iran to remain busy with the threats of the Jewish entity, and incitements of the European trio: Britain, France, and Germany, and raising new problems for Iran, allowing it to remain living under the threat of sanctions. Iran has agreed to reduce its stockpile of low-enrichment uranium (LEU) from 10 thousand kilograms to 300 kilograms at a rate of 3.67% for 15 years, and pledged not to build any new nuclear facilities for the enrichment of uranium for 15 years. It has agreed to reduce the centrifuges by two-thirds bringing it down from the current 19,000 to 6104 under the agreement, with only 5,060 allowed to enrich uranium over the next 10 years. Natanz Facility will be the only facility used for the enrichment of uranium in Iran with decreased amounts. Iran will not enrich uranium at the Fordow Facility for 15 years, instead it will be utilized for nuclear and physics research. Iran is committed to a plan to enrichment and research which it will provide to the International Atomic Energy Agency to ensure that it will prevent it from developing a nuclear bomb for 10 years. The agreement grants the right to the international observers to monitor the uranium mines and sites of yellow cake manufacturing for 25 years, they also have the right to continuous monitoring of the centrifuges and the stores for 20 years with the freezing of the centrifuges manufacturing.” (Middle East 03/04/2015). Iranian President Hassan Rohani said, “Iran will fulfill all the obligations they have undertaken, provided that the other party fulfills its commitments.” (World Iranian page 3/4/2015). Iran’s Foreign Minister Javad Zarif said, “The lifting of sanctions will be a fundamental step forward. We have stopped following an undesirable path by everyone. Not desirable for the process of nuclear non-proliferation or any other party.” (American Radio Sawa 2/4/2015). This goes to show that Iran had agreed to halt its activities of increasing uranium enrichment and accepted to bring it down to a minimum, so it cannot produce a nuclear weapon. It also reduced the number of centrifuges to one-third, and it will remain under international control for 25 years. This will be binding throughout this period as stated by its president. What matters to Iran is the lifting of its sanctions, Javad Zarif said, “The sanctions imposed on Iran will end when the procedures that have been agreed upon with the major powers are implemented.” This is so to play its role that is decreed by the United States in the region and to achieve its national interests, as some of its officials began to declare openly their dream of the Iranian empire. This is why it sacrificed its nuclear program! What appears from the Russians’ statements that the matter was previously planned and ready, what only remains is to sign it, this is why they did not see the need for the Foreign Minister to go back to sign. He was the one who stated that the matter was unusual, referring to US Secretary of State, who met with the Iranians the most, headed by their Minister of Foreign Affairs Javad Zarif, for weeks alone… and he intensified the meetings non-stop in the last week of 26/3/2015 till the time for signing at the end of last month. He called the foreign ministers from the rest of the group’s member states to participate in the signing! But before signing day, they left the meeting when they found everything was arranged, and that the United States insists on signing the agreement as is. The French foreign minister left angrily through the back door, and the German foreign minister was about to travel to the Baltic Republics, and the Russians, as mentioned above, did not return, and left his deputy there. The Chinese minister was not concerned with the issue, and the coolness of the British minister overwhelmed, so he did not show his outrage, nor satisfaction, but was waiting for what will happen in the usual English cunningness. But everyone eventually returned to the signing ceremony session, but to save face they began debating what was prepared by America, and they extended the debate to two days, and then signed the agreement without being able, or being enabled to change anything of significance in it! Russia’s Foreign Minister has said that the agreement between America and Iran was agreed prior to today, signing it now is only a political move, therefore, he did not see the need for his attendance in Lausanne, his deputy signed instead. Thus, the main role in the agreement was between America and Iran. The Republicans who control Congress showed their dissatisfaction with the agreement for partisan opposition reasons and electoral purposes to come. The deal was signed by the Obama administration, despite their opposition so that this administration achieves successes in foreign policy and to be able to use Iran in the implementation of projects and plans in the region. Chairman of the US House of Representatives John Boehner said, “The final agreement standards represent a disturbing difference in comparison with the basic goals set by the White House,” and he said, “The Congress must have the right to fully consider the details of any agreement before sanctions are lifted. The agreement announced on Thursday, 2/4/2015 represented a worrying deviation about Obama’s initial goals,” (AFP 3/4/2015). The Foreign Affairs Committee in Congress is scheduled to vote on the 14th of this month on a proposal that imposes on Obama’s administration to present the agreement to the Council and then vote on it. However, the Obama administration rejects that and says that the conclusion of such an agreement is part of the powers of the executive authority exclusively and the congressional interference in the matter will create a precedent. As for the position of the Jewish entity, Netanyahu said, “The framework agreement on Iran’s nuclear program threatens the survival of Israel.” (AFP 3/4/2015), knowing that before the announcement of a deal in Lausanne he called for any agreement should oblige a “significant reduction in the nuclear capacity of Iran” and he said “the best agreement would be the one that reduces the nuclear infrastructure. The best agreement will link the lifting of sanctions imposed to Tehran’s nuclear program by changing Iranian behavior” (Reuters, 1/4/2015), all of this was materialized in the Lausanne agreement. The extortionate position of Netanyahu is to get more aid and US pledges to protect the Jewish entity, and to confirm his previous position he expressed on this issue for the purposes of the election which he won, and to strengthen his relationship with the Republicans coming to power, as he perceives, in the upcoming US presidential election in 2016. Netanyahu went to America to deliver a speech in Congress at the invitation of the Republicans and spoke to them about the dangers of the agreement with Iran. He knows that the agreement undermines Iran’s capabilities to produce nuclear weapons and knows that Iran is playing a role in the region decreed to them by the America that benefits the Jewish entity largely; Iran protects the Syrian regime, which ensures its security on the Golan Heights, and it will occupy the area in internal wars and prevent the unity of the Islamic Ummah and the implementation of its project, which is to establish the Khilafah. Obama confirmed in a telephone conversation with Netanyahu the commitment of the United States to defend the Jewish state… Obama asked his national security team to “intensify negotiations with the new Israeli government on ways to strengthen security cooperation between the two countries” (AFP 3/4/2015). The United States has prepared and “cooked” the agreement with Iran, as it has also prepared and “cooked” the Geneva Agreement in 24/11/2013, all the other five states only had to read the agreement and sign it soon. But the signing was delayed for two days because of the discussions of other countries for saving face… then they agreed on it and signed it. The intent of America is to reduce the pressure and sanctions on Iran or lift them completely so that it can use Iran in the region and to play a decreed role set by America. That is why the Obama administration put all its weight and focused its thinking to accomplish this agreement, and to mark down its success in foreign policy, and this is why the American President considered it as a historical agreement. The only obstacle that remains in the face of the Obama administration are the Republicans in Congress who are working to show the failure of the Obama’s Democratic administration for electoral considerations. They want to make the President under their control. The conflict between the two parties appears to continue. It is expected that the Obama administration will be able to lift some of the sanctions imposed on Iran, but there are some sanctions that this administration cannot lift without the approval of Congress. It is therefore possible that some of the remaining sanctions on Iran will be suspended for a later date. The extortionist attitude of Netanyahu, Prime Minister of the Jewish entity is to get more US aid and pledges to protect his state, and to confirm his previous position he has shown on this issue for electoral purposes which he won, and strengthen his relationship with the Republicans because he believes they will be coming to power in the next US presidential election, because the Jewish state does not dare to cut resorting to America. As for Iran, it has waived its programs to increase uranium enrichment and accepted to bring it down to a minimum, so that it cannot produce a nuclear weapon. The number of centrifuges has been reduced to one-third. And will remain under international control for 25 years. It will be committed to it for all the agreed time, this was stated by its president What matters to Iran is the lifting of the sanctions and engagement in the region to play its role decreed by the United States under the pretext of common interests and achieve a role for itself in the region by joining with America. If the authority in Iran was more astute on events they would have learned that thorns do not produce fruits, as no good comes out of the big Shaitan, and the nuclear agreement in Lausanne is evident to this. Next PostInternally Displaced People: The Forgotten Calamity!